Remember that insanely good deal on huge bags of chocolate candy that popped up right after Halloween so that Amazon could clear out all of its unsold inventory? Yeah, it’s back and it’s priced just as low as it was back then. 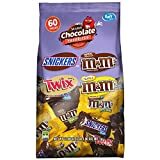 SNICKERS, M&M’S & TWIX Fun Size Christmas Candy Variety Mix Bags include 60 pieces of candy each, and they’re on sale for just $10. That’s a ridiculously good deal and it probably won’t be around for very long.